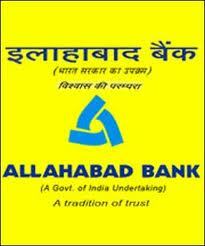 Allahabad Bank with its headquarters in Kolkata was founded by a group of Europeans at Allahabad on 24 April 1865. Allahabad Bank invites application from eligible candidates for recruitment to the post of Probationary Officers (PO) on probation period of two years. IBPS Score Requirement: Candidates should have valid IBPS Score Card obtained in Common Written Examination (CWE) for Probationary Officers (POs)/ Management Trainees (MTs) 2011-12. Total Weighted Score for General Category candidates are 125 and for Reserved Category candidates are 112. NOTE: Candidates should also secure minimum marks, i.e. 24 for General category and 21 for Reserved Categories, in each subject including descriptive test in CWE. Application Fee: Fee for General and OBC category candidates is Rs 200 and fee for SC/ ST/ PWD category candidates is Rs 50. The fees need to be paid in the form of challan at any branch of Allahabad Bank and pay, in Cash, in the designated Account No. 50087755346 in the name & style of"Allahabad Bank Probationary Officers' Recruitment Project-2012-13". Obtain both the Candidate's & GD/ Interview Copy of the Fee Payment Challan, duly receipted by the Bank with (a) Branch Name & Code Number, (b) Journal number, (c) Date of Deposit & amount filled by the Branch official. Selection Procedure: The candidates will be selected on the basis of 2 tier process mentioned below. Tier I: Candidate should have appeared in Common Written Examination (CWE) conducted by IBPS in September 2011/ November 2011 and should have obtained the minimum category-wise cut-off in the Total Weighted Standard Score (TWS Score) as stipulated by the Bank to become eligible and are in possession of Valid Score Card. Tier II: Depending upon the number of category-wise vacancies, only a certain number of eligible applicants in the descending order of Total Weighted Standard Score (TWS Score) in the Common Written Examination (CWE) conducted by IBPS, Mumbai in respective category will be called for Group Discussion and Interview or only interview at the discretion of the Bank. The Group Discussion, if conducted, will be qualifying one i.e. the marks in GD will not be recognised for merit ranking. Only those candidates who secure the qualifying marks in the Group Discussion will be considered for interview. A Personal Interview of 35 marks shall be conducted to assess the candidate's academic record, power of expression, clarity of thought, qualities of leadership, extra-curricular activities, hobbies, general demeanour, behaviour, communication skills, suitability for the post, etc. The minimum qualifying marks for the Personal Interview would be 40% marks (35% marks for SC/ ST/ OBC & PWD). How to Apply: Candidates need to apply online on the Allahabad bank's websitehttp://www.allahabadbank.com/ After applying On-Line, take two (2) Print-Outs of the duly filled in Computerised System Generated Application Form. The Candidate is required to download a copy of the Application Form and keep ready with the one set of the prescribed documents to be brought along and submitted only when invited for the Personal Interview. Ensure to also bring along the Original Documents for verification when invited for the Personal Interview. The other Print-out is to be retained by the applicant for future reference.